The PCMD50's electret condenser microphones have exceptional high sound quality and offer a selection of 2 operating positions, X-Y and Wide Stereo. X-Y covers a wide sound range with good depth, perspective and a natural sounding stereo image; or alternatively, a wde stereo position offering a wider spread stereo image. The PCMD50 is designed with four separate circuit boards to separate analog audio, digital audio, digital recording and power supply circuits. Separate circuit boards for each function helps minimize noise. The PCMD50 conforms to the USB 2.0 Mass Storage Class Device standard and this recorder's native recording file format is .WAV. This means recordings can be rapidly uploaded to a computer and used in conjunction with most common audio production software. The PCMD50 offers comprehensive signal processing features for location recording including a unique dual digital limiter function (inherited from the PCMD1 recorder), a high pass filter with selectable frequencies (150 Hz or 75 Hz) and SBM (Super Bit Mapping) noise shaping. In addition, the PCMD50 includes a 5 second pre record buffer with an A-B repeat playback function. 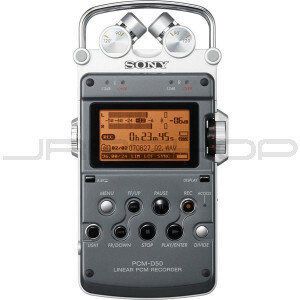 With a 4GB built-in memory, it records up to six hours when recording in 44.1kHz 16bit CD quality mode.